Empty food boxes: Cereal, rice, jello, cake mix, etc. Decide how you want each box to be utilized in this project (horizontal or vertical). Cut off edges of the box that will be the top. Secure all the remaining edges and reinforce if necessary. 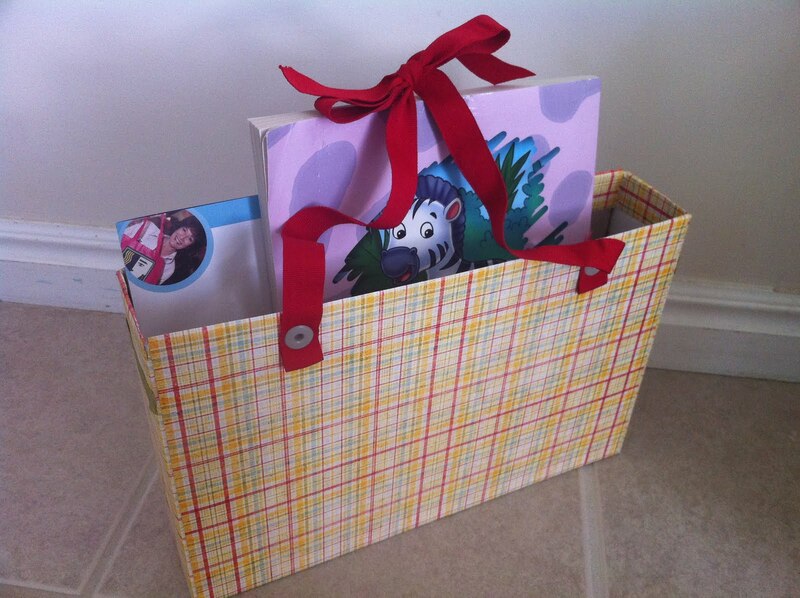 Cover each box with decorative paper or wrapping paper. Be sure to cut paper large enough to fold over the top edges and adhere them to the inside of the box. Glue boxes to each other in the desired location. Make sure to use plenty of adhesive, possibly even E-6000 to make sure they stay put. Hint: this project can be used on a table top as well as the car IF you create a solid bottom with all the boxes...meaning, make all the box bottoms even line up (don't have a smaller box bottom glued above the largest box bottom). Add embellishments...ribbon, flowers, bows, buttons, etc. Have the kids help you add the finishing touches. Next cut the ribbon piece in half. These will be your two ties so that you can secure it to the headrest of the seat in front of child's seat. Fold up the end of the ribbon 1" and punch a hole through the ribbon using your "Crop-a-dile". Do this to each piece of the ribbon. Now punch holes into the BACK top edge of the largest box. 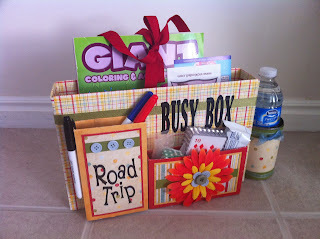 Place a grommet into each piece of ribbon and into the holes in the box. Set each grommet into place using your "Crop-a-dile". 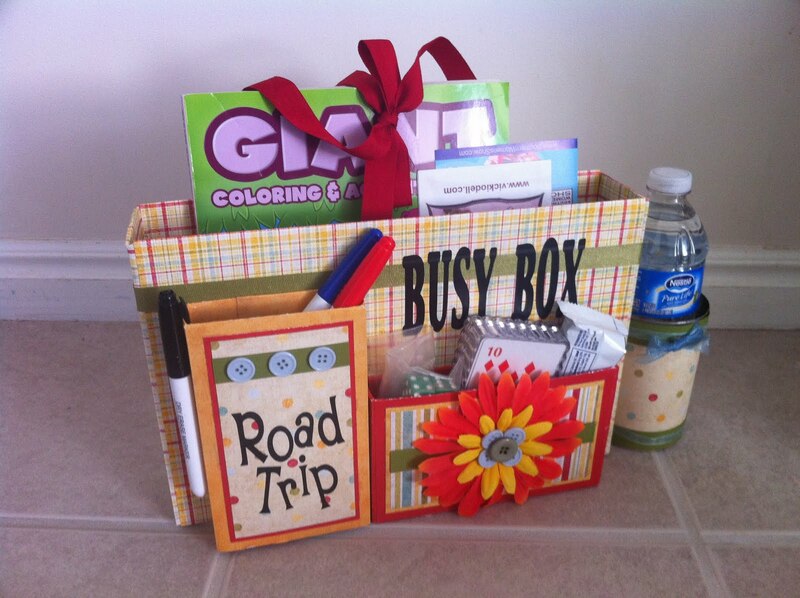 Add letters to spell out "Road Trip" & "Busy Box" or the child's name, etc. There are 4 ways to make an individual white board for your child. 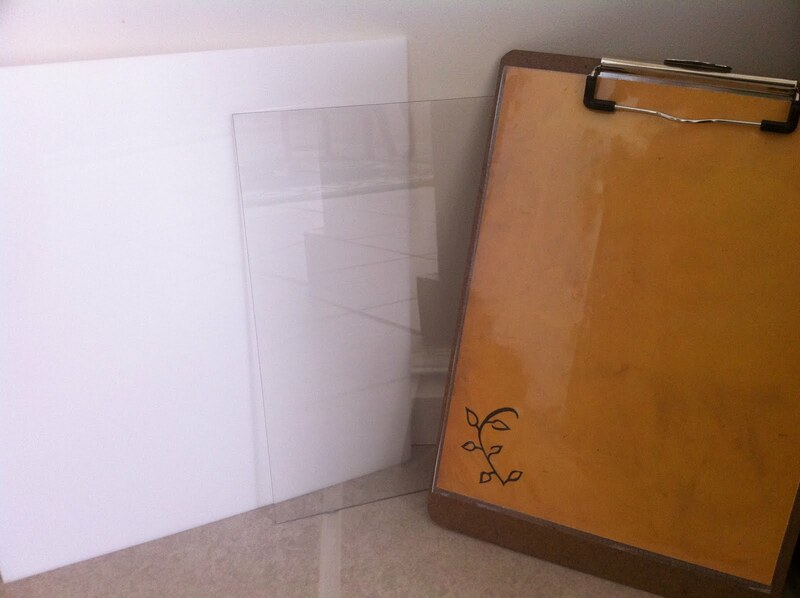 Take a clean page protector (NOT THE GLARE PROOF) and slide a piece of white card stock or chipboard inside. EASIEST WAY! Use a piece of white acrylic plexi-glass and cover the edges with vinyl adhesive or decorative duct tape. Another easy way! Take a piece of melamine board or old clipboard. Paint with high gloss white (or other color) paint. Let dry and add two more coats. Make sure each coat is COMPLETELY dry before adding the next so that you can maintain the nice smooth surface. 8X8 white ceramic tile...a little heavier, so not the best choice for a very small child, but again...very easy! ERASER: Take a 2"X24" piece of an old t-shirt, flannel or felt, fold accordion style and secure with a clothespin! Fast and easy!